Georgia’s top restaurants are fueling local economic development and giving us new and interesting tastes, propelling our dining scene onto the national radar. Plus, 10 of the state’s best restaurants with an international flair. Apologies to Dinah Washington, but … What a difference a year makes. At the time I wrote last year’s Silver Spoons, Atlanta was poised on the brink of a dining revolution. I wondered how the brand-new Ponce City Market (PCM), the ambitious gut renovation of the hulking, long-abandoned Sears store just east of Midtown, would affect an already percolating scene, with Inman Park’s just-hatched Krog Street Market already feeding the fire. Well, we’ve got our answer: These two powerhouses, featuring dozens of food-delivery systems, from tiny kiosks to full-service restaurants, now drive the intown dining market, not to mention its real estate, linked and abetted by the wildly popular Atlanta BeltLine and its pedestrian traffic. Can similar projects around the state be far behind? In Savannah’s bustling Starland district, Hugh Acheson’s The Florence predates those Atlanta live-work-play projects in a former ice factory; nearby, the brand-new The Vault Kitchen + Market uses this former bank’s teller windows to deliver Korean BBQ tacos. Macon downtown restaurant specialists Moonhanger Group are making a business of combining food and music in great old buildings: After rescuing the Allman Brothers’ favorite, H&H Soul Food, the group this year opened El Camino next to their historic Cox Capitol Theatre venue for hungry concert fans. Now they’re planning to expand their signature downtown Rookery/Dovetail restaurant space into the building next door, with one partner launching Americana radio station The Creek 100.9 upstairs and a performance space and vinyl record shop on tap for the lower level. Farther north, Athens’ compact, walkable downtown and student-friendly prices have made the Classic City a diner’s dream. Of course, there have been casualties as well. Atlanta’s 4th & Swift, the longtime favorite from talented chef Jay Swift, could not survive the giant sucking sound of nearby PCM’s foodie vortex. Two hotly anticipated restaurant openings, Marcel and Linton’s at the Atlanta Botanical Garden, from two of the city’s best chefs, Ford Fry and Linton Hopkins, drew harsh reviews, signaling perhaps that these chefs’ recent rapid growth elsewhere, including at PCM and Krog Street Market, had momentarily drawn off their attention. Meanwhile, Sea Island’s the Georgian Room boasts consistently sumptuous, creative food and expert service, but a midweek meal found one of the state’s few remaining truly fine dining rooms nearly empty. You’ll still find throngs at the luxury resort’s Sea Island Lodge, however, where Colt & Alison’s old-school tableside Caesar salad has been reinstated, alongside its well-charred steaks and well-made Manhattans. In Savannah, Johnny Harris, perhaps the state’s oldest restaurant, closed in May. The owners cited the high cost of maintaining the aging structure and its circular dining room, where generations of Georgians and renowned celebrities enjoyed the barbecue for 92 years. However, at St. Simons’ Southern Soul, old-school and new-school native-born dishes, including wood-smoked barbecue, are proudly delivered to crowds on trays by young servers and staff who seem to take genuine delight in their wares. So, out with the old, and in with the new. This year, youthful joy and pride seem to be part of the mix at my favorite places, as well as a general glee in breaking barriers. Whether it’s Staplehouse’s chicken liver tart or the croissants and espressos served by kids in berets at Korean-born franchise Paris Baguette on Buford Highway, we’re busting out all over. This year, in addition to the Top 10 Silver Spoons for the state’s best restaurants, I’m adding a second list. These restaurants represent another kind of border crossing, whether with the once-derided culinary term “fusion,” or a more organic combination of homegrown dishes and imported or international flair. I’m calling these places our Best Georgia Dateline Crossings and awarding them a Silver Boarding Pass. Pride, passion, poignance. You don’t need to know the backstory or the nonprofit it funds to aid culinary workers, The Giving Kitchen. You just need to taste this food and be in this room. You’ll understand, and you’ll be back. This little barbecue joint with the heavily tatted young serving staff and hard-working wood smokers out front is now so popular it’s almost a tourist destination. But everyone sure looks happy with this ’cue, these ribs, that hoppin’ john, those collards, that cold beer. Perhaps its day, and its high-priced, classic style of service, is passing. But I love this place and will cling to its white asparagus and langoustine, and its little ottoman for my purse, as long as I can. 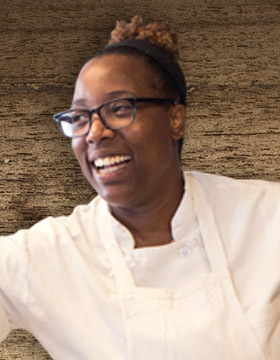 Chef Mashama Bailey hits the sweet spot with her elegant but gutsy interpretations of Southern classics in a beautifully renovated Deco-style former bus station. A few minutes from downtown Savannah, take a car or boat to go Wyld. This weathered dockside favorite features creative cocktails and excellent fare like seared flounder and bacon-laced succotash. My favorite special occasion restaurant, and perhaps the state’s best place for celeb-spotting. Classic, pristine sushi in an intimate space, plus creative, succulent desserts from husband-and-wife chefs Fuyuhiko and Lisa Ito. Comfortably ensconced above the St. Regis lobby, you can savor both the fine art and the clear flavors of unfussy American cuisine. Still the state’s most elevated and creative versions of the Southern vernacular – a true oral tradition. On the verge of moving from its Westside Provisions space, where it drove restaurant and real estate trends for 17 years, the venerated restaurant will reinvent itself once more next year on nearby Ellsworth Industrial Boulevard – closer to the Atlanta BeltLine. A recent visit shows that Hugh Acheson’s first love has aged well. It’s still fueling the culinary scene in the Classic City, as well as the entire South. The little Ethiopian restaurant that could has spawned an entire biosphere of restaurants and businesses around its Briarcliff neighborhood, but this is still the busiest and best. Welcoming and knowledgeable staff, quick service and delicious food, including the traditional dish gomen, known to Southerners as collards. Guy Wong has been busy. The Miso Izakaya chef this year also launched his jammed ramen spot, Ton Ton, in PCM. But I love this funky “vintage Vietnamese” spot near Georgia Tech, with faux faded wallpaper and old-fashioned fluorescent tube lights. The music alone makes it worth a visit, but you’ll also like the Drunken Noodles and the fried chicken with slaw (cabbage and fried garlic), as well as the Hemingway daiquiri. Ele and Sean Tran have several Savannah restaurants, including downtown favorite The Flying Monk Noodle Bar, with its lychee martini. All feature some genre-ending dishes, but none more so than The Vault, with its “Deposit Box” Asian duck tacos and Mango Passion Moscow Mule. New owners have infused fresh life into this longtime favorite, as well as its classic French dishes mixed with Southern favorites like shrimp and grits, in a Macon residential neighborhood. In this case, the mainstream has come to the mountain. Ramen is all the rage these days, and Umaido is one of Georgia’s elder statesmen in the arts. The owners have also recently opened Hajime, on Cheshire Bridge Road in Atlanta, but we love the almost baffling number of options (including a shot of “rich broth”) at this original location. A welcome, affordable addition to downtown Macon’s dining scene, with smoked chicken wings with pickled celery alongside soft-shell tacos and pinto bean hummus. Yes, I know – Hawaii is is one of the 50 states. But let’s face it, for one of Carrollton’s biggest and most successful restaurants to feature food from the Aloha State (lots of noodle bowls and hibachi-grilled meats) is exotic at the very least, but also … well, a lot of fun actually. Don’t miss the tiki cocktails. Chef Eddie Hernandez pioneered the concept of a Southern-flavored taqueria (Memphis chopped smoked pork barbecue tacos, turnip greens). Apparently it travels well: Taqueria del Sol now has several outposts, including in Atlanta, Athens and Nashville. Hugh Acheson’s take on Italian food and wood-fired pizza, with local ingredients and a relaxed Southern vibe. Known for its inexpensive, authentic Vietnamese fare, this family-friendly, bring-your-own-beer Buford Highway staple also features one of my favorite versions of chicken wings in town, sticky and spiced to order. (A second location is in Norcross.) The owners have also recently opened an “Asian gastropub” in Peachtree Corners, Ba Bellies, featuring those same wings, along with shrimp po’boys and a beet-chevre salad.